It’s an indisputable fact that rapper/actor Common is one of the most highly respected elder statesmen in hip-hop. After he debuted back in 1992 with his first album, Can I Borrow a Dollar, it has been quite the journey for the Chicago native. Last night, the rapper shared some of that journey at the State Theatre as the headlining artist at this year’s Tri-C Jazzfest. You can see a slideshow of photos from the concert here. Common emerged onto the stage in darkness, but his recognizable silhouette garnered cheers from the eager crowd. A portion of Nat King Cole’s “Nature Boy” played and set the course for what was to come. In addition to the rapper himself, there was also a full band, a DJ and backup vocalist filling out the stage. The first two songs were “I Used to Love H.E.R.” and “Love of My Life” — two standards in the emcee’s catalogue, without question. 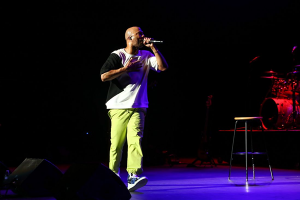 Common told the story of how he fell in love with hip-hop at age 12 and recording with his cousin from Cincinnati and then performed the first song he made. He went on to say that when he was younger he compared himself to Michael Jordan and even jokingly apologized for what Jordan did to the Cavaliers in the ’80s.